I’d call Nina Ricci L’Air du Temps “youthful,” except that I’m not sure anyone young today would wear it, except ironically. Yet, L’Air du Temps seems ill fit for a mature woman. I imagine it on a mid-century ingenue, say Natalie Wood. L’Air du Temps’s clean, full floral bouquet with a hint of clove is too innocent for most people today over the age of 16, yet, at the same time, too old fashioned to appeal to them. Francis Fabron, author of Givenchy L’Interdit, also developed L’Air du Temps. 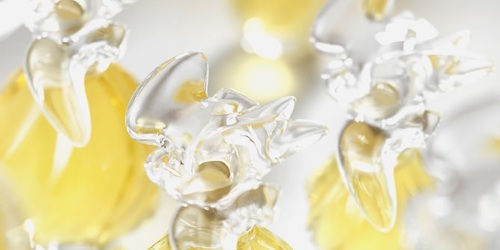 The fragrance launched in 1948 — the height of Dior’s New Look — and features notes of carnation, gardenia, rose, jasmine, iris, sandalwood, bergamot, peach, rosewood, neroli, clove, rose de mai, ylang ylang, orchid, lily, gardenia, jasmine, sandalwood, ambergris, musk, vetiver, benzoin, moss and cedar. One more note: in one of the creepiest movie scenes ever, in Silence of the Lambs the serial killer Hannibal Lecter sniffs the air while being interviewed by rookie F.B.I. agent Clarice Starling and identifies her perfume as L’Air du Temps. This review is from a a sample vial of the vintage Extrait, likely from the 1990s. What I smell is undoubtedly not as sharp and glorious as it would have been, but is still a grand floral thick with classic white flowers, kept from being overly bridal with a wash of rose and spicy carnation. The fragrance’s bouquet is dense, and I can close my eyes and pick out its gardenia, jasmine, rose and carnation, especially. L’Air du Temps’s underpinnings are soapy musk thickened with moss, amber and sandalwood. It’s a solid, old-school perfume foundation that you don’t smell much these days, but which seems as fundamental as pale pink girdles and scented stationery. My sample simmers on my skin for a few hours, but not much longer. After an hour or so, L’Air du Temps’s floral richness fades to what smells like a wash of expensive soap. It’s gone after half a day. Really, L’Air du Temps isn’t particularly groundbreaking. Its vibe isn’t a million miles away from other clean, classic florals, such as Elizabeth Taylor White Diamonds. Like crisp sheets, L’Air du Temps is the sort of basic that never ages. The problem is that it has stopped feeling fresh. No matter how pure the cotton, a plain white muslin sheet might start to come off as boring when sexier options await. I love Doris Day (and plain muslin sheets). But how would she play today? I bet many of you have worn L'Air du Temps over the years. What do you think of it today? Nina Ricci L’Air du Temps is widely available in a variety of formulations and products, starting at $18 for 50 ml of Eau de Toilette. 1. Nigel Groom, Perfume: The Ultimate Guide to the World’s Finest Fragrances (Running Press, 1999), p. 161..
2. Turin, Luca and Tania Sanchez. Perfumes: the A – Z Guide (Penguin Books, 2008), p. 77. 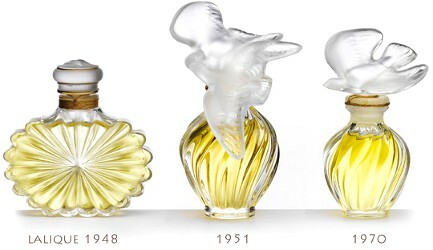 My mother wore L’Air du Temps in the sixties, and I remember loving the dove on the bottle, but not loving the smell. I have worn some of my mother’s other favorites from later years, such as Anais Anais and Sunflower, but I never had an interest in L’Air du Temps. It really is a beautiful bottle, and I respect the fragrance, but it’s not for me, either, even as much as I love old-fashioned scents. Maybe I’m simply too old for it. 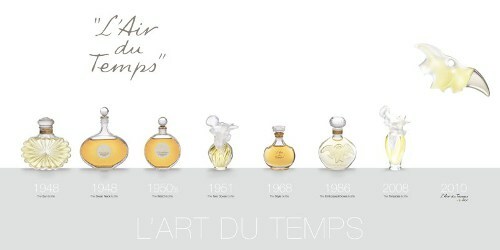 The bottle I had of L’Air du Temps would have been from the 1970s…I wore it many years ago…and I remember loving it. Oh, nice! It sounds like L’Air du Temps would be a good one to smell different vintages of. Wore it the other day and really enjoyed it. Nicely crafted and beautiful, deliciously soft and nice to wear, and to me it just feels classy, a little like Chanel No 5. My EdT is from the late 80s. I love the description “soft and nice to wear.” That sounds so easy and appealing. L’Air du Temps was the signature perfume of a beloved ballet teacher in my early teens (in the 90s). At the time it smelled like Please Let Me Grow Up Like Her but now I know it smells like Elegance wrapped in Kindness. Both could be excellent perfume names, too! I definitely would try a dab of Please let Me Grow Up Like Her. That’s exactly how I feel about Revlon Moondrops! I think I’m with LT on this one. It starts out beautifully but as it dries down it gets thinner, harsher, more synthetic. The little bit of budget still spent on preserving LADT is all in the first 15 minutes. That’s my reaction to LADT but I see that there are plenty of rapturous reviews on Fragrantica, and not all of them based on nostalgia alone. And I can see why women would have adored it when if first came out, especially Parisians. Just being able to obtain and afford a bar of soap would have been a wonderful thing. Imagine that fresh, soapy feeling in a perfume. It must have been glorious! It has a lot of white-cotton-eyelet-in-the-sun feel, and I can see that being appealing, especially if you like a floral, too. I haven’t smelled new L’Air du Temps, though. I probably won’t go out of my way to. Angela, thank you for the review and for being kind. Sigh and cue the sad violins. I love L’air du Temps endlessly. My mum wore it for special occasions. Her bottles (from the 1970s) are glorious, an empty one still scents her bathroom cupboard. She no longer wears perfume, so I sneak sniffs and spritzes when I can. That said, a dove bottle I purchased a few years ago was WEAK and smelled nothing like the old stuff. Sad. A cylindrical bottle I found (at Target!) smelled better, but I didn’t buy. Maybe someday. I’m sorry you’ve lost the old L’Air du Temps you loved! Maybe it will be reformulated yet once again, and this time to regain some of its old glory. Haven’t smelled this in years. I wore it in the ’70s and loved the little bottle with the bird stopper bottle so much. I honestly don’t remember the scent. The bird bottle is so memorable! I bet more people remember it than they do the perfume itself. As a bottle aficionado, I can say that the double bottle is my choice for the most beautiful of all time. My mom had a small bottle that I gave her, probably in the early ’80’s. I wanted to find it in her house but never did so I eventually got another empty to replace it and remind me of her, along with an Evening in Paris. As for the fragrance, I loved it! I would still wear it if I didn’t have countless others to use up. Chant D’Aromes is a great substitute: a woody floral that’s so well-blended I can’t smell the gardenia. I’m not a fan of big white florals that contain gardenia, neroli, and jasmine. It truly is a magnificent bottle! I’ve never see one in real life, but the photos are lovely. The atomizer broke on my bottle of Chant d’aromas, and I’m heartbroken. I think I’m going to have to break it off and decant the fragrance. When we were young my cousin wore L’Air du Temps and I wore L’Interdit. Although I thought it was a nice perfume at the time, L’Air du Temps was never my style. L’Air du Temps seems to be a basic type of fragrance–sort of like white linen slacks–but, like the slacks, doesn’t suit everyone. This was my mother’s fragrance too when I was growing up (worn on special ocasions like her birthday, with Sea Jade cologne for not so special, though she really aspired to Joy). As\a result it was the first perfume I wore. It was gentle, feminine, but still interesting enough, even as I grew older. This will have been about 35-40 years ago. My own tastes evolved differently, starting with Avon Timeless and Eau Givree and O de Lancome (original version), then when I started earning an income Ysatis (original version), but I still always had a bottle of L du T to wear now and then. It was never ‘mine’ enough for me to splash out on the extrait though (too much my mother’s fragrance for that). Somewhere between the 1986 and 2008 bottles it became too thin and pale a shadow of it’s former self. I was dreadfully disappointed by the version in the (then new) 2008 bottle when I tried it – so thin and short, with the carnation seemingly excised completely. I still have some EdT in the older ’80s-’90s splash bottle (and a gold printed cylinder EdT spray from the same time), and enjoy a nostalgic wearing now and then. To me, the versions later than this are so different they don’t convey the appeal of the original fragrance anymore. The 1986 style bottle EdT is still quite readily available on fleabay and not that expensive, so I’d try there is you want to try something closer to the original feel of this. L’Air du Temps seems to have been many people’s mothers’ favorite! Thanks for weighing in on the different formulations and which ones to try to get a sense of the original. I appreciate that. Really happy to see this one finally reviewed here on NST. I own vintage EdT and I look forward one day to owning vintage Parfum (which I have heard is more carnation prominent). Unlike many carnation scents which smell too much like cloves, this one actually *does* smell like a carnation which is why I think any man can easily rock this one (and I do). I like it post-gym…or whenever I’m in a carnation mood. I love it! I have a hunch that real carnations are going to make a comeback in flower bouquets and gardens, too. There’s something about them that hovers on the edge of chic. I hope you’re right about carnations, Angela! They’re one of my favorite scents and flowers. I do think a monochrome group of pale or dusty pink carnations in a jar looks very chic in a minimalist way. Yet there’s something charmingly old-fashioned about them, too. Here’s to carnations! And to more spicy dianthus in the garden. I remember this scent from the 1980s and loved it. I thought it was so elegant, but so pretty. I frequently grab it when passing through the perfume section at department stores to give it a sniff (I’m pretty sure I’m grabbing the edt), hoping and hoping to recapture the magical scent I remember. I am always disappointed. I also appreciate the over the top sentimental bottle with the two (or one) dove. So many people have such nice memories of L’Air du Temps! It sounds like it’s ripe for a careful reformulation and resurgence. Dear Angela, Have you ever done a review of Bellodgia? I haven’t tried it for its carnation content but have seen bottles in the antique store. Do you like L’Heure Bleue? It looks like Robin reviewed Bellodgia in 2007; here’s a link to it: http://tinyurl.com/m7wwzwg. And, yes, I adore L’Heure Blue! It’s so classically feminine, yet intriguingly off-kilter. I realize that I haven’t worn it for a while. I’ll have to move it to the front of the perfume cabinet.